Dr. Singh began his new role at TTUHSC El Paso on June 13, 2015. 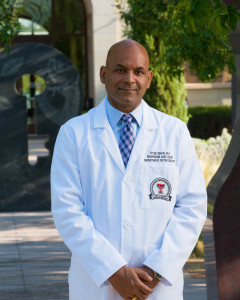 During his brief time in El Paso, he built strong community relations and hired six new faculty physicians. In less than five months, Dr. Singh built the foundation for a world-class psychiatry department that will continue to work with the El Paso community to identify and address the mental health needs of the population, provide cutting edge care to those with mental illness in El Paso, and integrate mental health into primary care settings. Dr. Singh came to TTUHSC El Paso from the University of Texas Health Science Center at San Antonio (UTHSCSA) where he was a Professor of Psychiatry and Interim Vice-Chair for Clinical Affairs, Medical Director of University Hospital Psychiatric Services, Director of the Psychiatric Consultation Liaison Service, and Chairman of the Institutional Review Board. Dr. Singh received his M.D. from Gandhi Medical College in Hyderabad, India, and his M.P.H. degree from the School of Public Health at the University of Illinois. Following his residency at the Cleveland Clinic Foundation, he obtained post-doctoral fellowship training in psychopharmacology and biological psychiatry at UTHSCSA. He was board certified in Psychiatry and Psychosomatic Medicine by the American Board of Psychiatry and Neurology. His clinical, research, and teaching activities were focused on bipolar disorders and Psychosomatic Medicine. Dr. Singh authored numerous articles and book chapters on bipolar disorders. He was also an active reviewer for several psychiatric journals and member of editorial boards. He was a highly sought after national speaker on bipolar disorders and educated practicing psychiatrists in the assessment, diagnosis and treatment of this illness. Dr. Singh was actively involved with the International Society for Bipolar Disorders (ISBD) where he was Vice-President of Education and Chairman of the Education Committee. He was also a member of the Executive Committee and on the Board of Councilors of the ISBD. He was the Editor-in Chief of the International Society for Bipolar Disorder Global Newsletter since 2010.